The below specifications apply to the THC: Marijuana panels of the One Step Drug Tests. This includes the 1-panel One Step Marijuana Drug Test - plus any multi-panel drug test containing a THC panel. The following table lists compounds that are positively detected in urine by the THC One Step Marijuana Test Strip at 5 minutes. 11-nor-D9-THC-9 is the target compound. A study was conducted using the same clinical specimens with ten percent (10%) distribution at 25% above and below the 50 ng/ml cutoff at three geographically distinct point of care sites to determine the accuracy of the THC One Step Marijuana Test Strip in the hands of point of care user. Forty (40) positive specimens and forty (40) negative specimens were tested on three (3) different lots of each product. The difference in sensitivity and specificity results obtained by the laboratory professional for the same clinical specimens compared to the results obtained by the point of care (untrained) user was insignificant. At a ninety-five percent (95%) confidence interval, the odds ratio for the point of care user versus the laboratory professional was 1 to 1 for sensitivity and specificity. A study was conducted at 3 physician's offices by untrained operators using 3 different lots of product to demonstrate the within run, between run and between operator precision. An identical panel of coded specimens containing, according to GC/MS, no 11-nor-D9-THC-9, 25% 11-nor-D9-THC-9 above and below the cutoff and 50% 11-nor-D9-THC-9 above and below the 50 ng/ml cutoff was provided to each site. For the specimens below the -25% cutoff concentration, the 3 sites demonstrated 98% agreement with each other. For the -25% to +25% cutoff specimens, the 3 sites demonstrated 83% agreement with each other. For specimens above the +25% cutoff concentration, the 3 sites demonstrated 94% agreement with each other. For all results, the 3 sites were found to have a 91% agreement with each other. A study was conducted to determine the cross-reactivity of the test with compounds in drug free urine. The following compounds show no cross-reactivity (were not detected positive) when tested with the THC One Step Marijuana Test Strip at a concentration of 100,000 ng/ml. Twenty-six (26) urine samples of normal, high, and low specific gravity ranges were spiked with 25 ng/ml and 75 ng/ml of 11-nor-D9-THC-9, respectively. The THC One Step Marijuana Test Strip was tested in duplicate using the twenty-six neat and spiked urine samples. The results demonstrate that varying ranges of urinary specific gravity does not affect the test results. The pH of an aliquoted negative urine pool was adjusted to a pH range of 5 to 9 in 1 pH unit increments and spiked with 11-nor-D9-THC-9 to 25 ng/ml and 75 ng/ml. 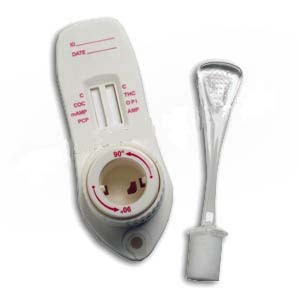 The spiked, pH-adjusted urine was tested with the THC One Step Marijuana Test Strip in duplicate and interpreted according to the package insert. The results demonstrate that varying ranges of pH does not interfere with the performance of the test.